Star openers Sachin Tendulkar and Virender Sehwag are likely to miss the action as India take on Australia in the triangular series match here tomorrow, hoping to keep the psychological edge over the world champions. The Indian cricket team today sprang to the defence of vice-captain Rahul Dravid who was fined 50 per cent of his match fee for changing the condition of the ball during the day-night clash against Zimbabwe in Brisbane yesterday. Mahesh Bhupathi and Max Mirnyi overcame an erratic performance to advance to the second round of the men’s doubles at the Australian Open in Melbourne today. MELBOURNE: The world’s leading tennis players are living in fear of testing positive for banned drugs; scared to drink anything but water, Andre Agassi said on Wednesday. Outstanding sportsmen and women of Punjab Police are feeling angry and resentful. For the past several months official communication received by them is either about their reversion to their substantive ranks or show-cause notices asking them to explain why they should not be reverted from Inspectors to Constables. Mr Sukhdev Singh Dhindsa, Union Minister for Chemicals and Fertilisers and Mr J.S. Grewal have been re-elected president and secretary-general of the Cycling Federation of India. Representatives of all affiliated units of the CFI attended the meeting held at Ludhiana on Monday. The ongoing 8th edition of the National Football League will have a month-long break from January 24, to facilitate the selection of the national team from 35 probables for the pre-World Cup qualifying matches. First sports and athletic meet organised by Border Zone concluded here today. Hockey team of Border Range, Amritsar, beat Ferozepore Range 5-0. S.K. Sharma, IGP (Border Range), Amritsar, presented awards to the winners. Namdhari XI and Punjab Police stormed into the semifinals of the DCM Shriram All-India Hockey Tournament with wins over Corps of Signals and CRPF, Delhi respectively here today. Bull fights draw huge crowds in Tamil Nadu. While Tendulkar and Sehwag may be kept out of the match so that they fully recover from their niggling injuries, India’s bowling attack received a boost with paceman Ajit Agarkar declared fit to resume duty. Tendulkar suffered an ankle injury during his knock of 86 against Australia in Brisbane on Sunday and missed yesterday’s match against Zimbabwe while Sehwag, down with a shoulder sprain, last played against Zimbabwe at Hobart on January 14. With their tails up after beating Australia in their own den for the first time in 12 years, captain Saurav Ganguly is demanding “complete intensity” from his team in what promises to be a pulsating day-night game at the Sydney Cricket Ground. “We two are probably headed for the finals but we are really keen to do well against them in the final two league games. We feel it would count in the finals,” Ganguly said. Ganguly, by the looks of it, is relishing the prospect of taking on Australia and his adrenalin level has not been down despite some very intense games against the world champions in the past couple of months. The Indians flew in to Sydney this morning, a bit sheepish on the Rahul Dravid affair, which might have been judged wrongly by match referee Clive Lloyd, but there is little to believe the Indian vice-captain was trying to take recourse to unfair practice against a side which has held little threat in the competition. Ganguly has had a close look at his reserve bench and has a fair idea of their capabilities. He liked what he saw from Irfan Pathan in the last few weeks and Laxmipathy Balaji is quickly growing in confidence. Allrounder Rohan Gavaskar, Hemang Badani and wicket keeper Parthiv Patel, who failed to utilise a good chance yesterday, also have the potential though it is different with Railway players Murali Kartik and Sanjay Bangar. Ganguly is struggling to make up his mind on how best to use the two in this series. The absence of Tendulkar and Sehwag would be welcome news to Australia and their bowlers who have been at the receiving end all through the summer. Brett Lee sure would not miss them, that is if he plays at all in front of his home crowd. Lee might still get another game despite being clobbered by the Indians since Australia would hate not to support an express fast bowler who was terrorising the batsmen world over on their behalf. The absence of the two seasoned openers might just perk up Ganguly who relishes the one-day arena and has appeared keen in all the games he has played. He has had a few starts in this series and would really like to get a big score at Sydney. It also affords an opportunity to youngsters like Yuvraj Singh, man of the match yesterday, Badani, Gavaskar and Patel to shoulder the burden and let themselves be counted. The hosts will miss the aggro of Matthew Hayden at the start of the innings as they have become used to relying on the burly Queenslander to give them slapdash starts. Hayden has been “rested” which probably is true to the word since the left-hander had made a brilliant hundred against the Indians in the last encounter at Gabba. Australia: Ricky Ponting (captain), Adam Gilchrist, Damien Martyn, Simon Katich, Michael Bevan, Andrew Symonds, Michael Clarke, Andy Bichel, Brett Lee, Brad Hogg, Brad Williams and Jason Gillespie. “Everyone knows who Rahul Dravid is. It was an innocent mistake which has been blown out of proportion,” said captain Sourav Ganguly to the Australian media and papparazi who descended in full strength at the Kingsford Drive Airport at Sydney this afternoon. The incident involving the player respected for his pure batting technique and the squeeky clean image has taken the cricketing community in this part of the world by storm. Dravid was hounded by the media and television crews who circled him, thrust microphones in his face and hustled the Indian vice-captain who maintained great calm. Dravid was charged under clause 2.10 of the ICC’s code of conduct, which deals with “changing the condition of the ball”, by match referee Clive Lloyd last night during Zimbabwe’s innings in a match which India won by 24 runs. Dravid, however, escaped the maximum penalty of a two-match ban. Indian coach John Wright described the object, which Dravid was spotted applying on the ball, as a “sweet lozenge” and termed it an “innocent mistake” on the part of player. “It was an innocent mistake, to be quite honest. “During the drinks break the players have these energy sweets. Rahul was shining the ball with saliva, at the same time as eating a sweet. “He didn’t realise that until he looked down and saw that yellow stain on the ball. That’s when he tried to wipe it out. 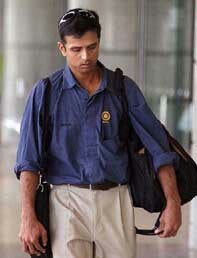 Wright said Dravid was extremely upset at the incident since he is a cricketer of great integrity. “He is upset about it because he is a man of great integrity. He respect the sport and the laws. It’s not something that will make anyone happy. “I have worked with Rahul for about four years now and he is what cricket is all about. “He’s one of those characters you want playing cricket with,” said Wright. “He’s everything that the game needs. Islamabad: Pakistan Cricket Board Chairman Shahryar Khan has said that despite the security concerns the Indian team would play both in Karachi and Peshawar during its tour in March and April. Dronacharya Desh Prem Azad appreciated the gesture of the Pakistan Cricket Board for naming the forthcoming India-Pakistan cricket series after legendary all-rounders Kapil Dev and Imran Khan. “I appreciate the role of both the cricket boards in recognising the invaluable contributions made to promote the gentlemen’s game by these cricketers of the region,” said Azad, who has produced a number of international cricketers, including Kapil Dev, Yograj Singh, and Ashok Malhotra. Marat Safin serves to Finland's Jarkko Nieminen at the Australian Open on Wednesday. Safin won 7-6, 6-4, 4-6, 6-4. James Blake of the USA dives to play a shot against Ecuador's Nicolas Lapentti at the Australian Open in this combination photo taken in Melbourne on Wednesday. Blake won 6-3, 7-6, 2-6, 6-1. Andy Roddick and Andre Agassi bounced two Czechs out of the Australia Open today as the Americans headed towards a semifinal clash of generations at the season’s first Grand Slam. World No. 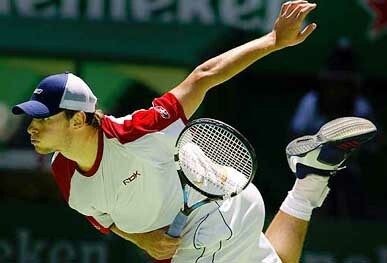 1 Andy Roddick, aiming to become the first man in 15 majors to win consecutive Grand Slam titles after taking the US Open in September, blasted aside 205-ranked Bohdan Ulihrach 6-2, 6-2, 6-3 in a 73-minute second-round romp. Roddick, the youngest end-of-season No. 1 in tennis history, broke Ulihrach’s serve five times and served 20 aces with his service on song. He now faces 22-year-old American Taylor Dent in round three. Fourth-seeded Agassi, at 33 the oldest man in the tournament, dispatched one of the youngest competitors with a 6-0, 6-2, 6-4 defeat of 18-year-old qualifier Tomas Berdych. Agassi romped through the first eight games against Berdych, but encountered stiffer opposition in the final set when the Czech held break point on Agassi’s service in the fourth game. “I like his game a lot. He has a lot of potential. He’s going to be a real good player,” Agassi said of Berdych. On the women’s side, top seed and world No. 1 Justine Henin-Hardenne continued her campaign for back-to-back Grand Slam victories by blowing away Camille Pin of France 6-1, 6-1. Agassi has now won his last 23 matches in the tournament and is shooting for five Australian titles in the eighth appearance in Melbourne, second only to Roy Emerson’s six. He has won eight Grand Slam titles. In round three, Agassi will face the experienced Swede Thomas Enqvist, but little else stands in the way of a semifinal match-up with young Roddick. 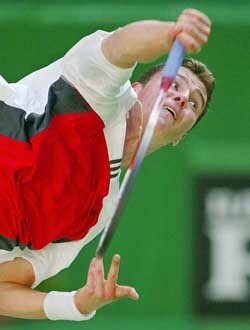 Among other seeded players, France’s Sebastien Grosjean, ranked No. 9, beat American Jan-Michael Gambill 6-4, 6-3, 6-2 and Sjeng Schalken of the Netherlands, seeded 16, defeated Spaniard David Ferrer 6-3, 6-2, 5-7, 6-1. Fourth-seeded Frenchwoman Amelie Mauresmo also powered her way into the third round, battering Czech Ludmila Cervanova 6-0, 6-2. Mauresmo looked every bit a credible challenger to Henin-Hardenne and third seed Venus Williams after losing just three games in her first two matches at Melbourne Park. The 23-year-old, an Australian Open runner-up in 1999, said the absence of Serena Williams and some other leading contenders had helped boost her chances for a first Grand Slam win. Bhupathi and Belarussian Mirnyi, the second seeds, needed an hour and 40 minutes before prevailing over Devin Bowen of the USA and Australian Ashley Fisher 6-3 4-6 6-3, according to information received here. In another match, Asian wild cards Prakash Amritraj and Hyung-Taik Lee of Korea made a tragic exit, retiring midway through their first round match against South African Wayne Ferreira and Rick Leach of the USA. Ferreira and Leach had won the first set from a closely contested tie-breaker when the Asian combination retired. Information on who was injured was not immediately available. Leander Paes and partner Tomas Cibulec of the Czech Republic were scheduled to play their first round match tomorrow. Meanwhile, reigning champions Paes and Martina Navratilova have been seeded fourth in the mixed doubles event. Bhupathi and Elena Likhovtseva of Russia are the second seeds behind Mark Knowles of Bahamas and Spaniard Virginia Ruano Pascual. Bhupathi and Mirnyi seemed to be rusty as they were playing together for the first time since the World Doubles Championship last season at Houston in November. They were up 4-2 in the first set before the Indian’s serve came under pressure in the ninth game. They saved three break points to win the game and set after seeing through six deuce. Bowen and Fisher broke Mirnyi to go 3-0 up in the second set and had two more break points with Bhupathi serving at 15-4. In the wake of Greg Rusedski’s positive test for nandrolone, Agassi said the situation “scares everybody”. “All it takes is a trace of something,’’ Agassi told reporters at the Australian Open. “That scares everybody. “Though we have been promised that none of us will be either removed or reverted, the content of show-cause notices or letters served on us paints us as culprits deserving punishment,” says an international basketball player holding that in the year of the Olympic Games, instead of concentrating on their training and preparation for Athens, sportsmen and women in Punjab are feeling depressed. “We have been given seven days to explain why we were promoted from Constable C-II list in excess of the 10 per cent quota as if we got ourselves promoted and elevated to the rank of Sub Inspector, Inspector and even Deputy Superintendent,” remarked another sportsman holding that all those who had given the country, the state and the department their youth were now being “given shabby treatment for wrongs, if any, committed by our employers”. The Director-General of Punjab Police, Dr A.A. Siddiqui, however, maintains that none of outstanding sportsmen or women will be demoted. “We have issued them show-cause notices before reverting them to their substantive rank of Constable before promoting them again to their present ranks. The reversion is necessary as we are to comply with the directions of the Punjab and Haryana High Court”. “The State Council of Ministers has already approved creation of 437 posts to adjust all these sportsmen and women,” says Dr Siddiqui revealing that efforts would be made that none of these sportsmen and women lose their seniority. We are also taking steps to ensure that no one loses any benefits, including pension”. “There may be a few cases in which certain sportsmen and women may lose some seniority but majority of them will be promoted to the positions they are holding in their present ranks immediately afterwards,” adds Dr Siddiqui, holding that all these conditions have been explained to most of the affected sportsmen and women time and again. “We can understand their dilemma. Everyone in the government is trying to help them. It is one time creation of additional posts approved by the Council of Ministers of the state,” concludes the DGP. Many of the sportsmen and women, however, have been running from pillar to post to save their jobs. They say that orders issued by the government clearly indicate that after reversion to the substantive rank of a Constable, they would be promoted to their present positions on year to year basis as the sanction for the additional posts is on year-to-year basis. “What happens in case any future government does not give sanction to the temporary positions created to adjust us. Does it mean that we have lost security of job and from regular government employees, we will become temporary or ad hoc employees whose continuation in service would depend upon sanction on year-to-year basis,” remarked another sportsman who has represented the country in Asian Games and Olympic Games also. Another sportsman pointed that all 437 sportsmen and women were found to be promoted from C-II list in excess of prescribed 10 per cent quota. Had they adjusted sportsmen against overall quota, by including all district police forces, the problem would not have arisen. The other office-bearers are :- vice-presidents — Mr Ram Dev Sharma (Rajasthan), Mr P. Suresh (AP), Mr Bani Ghosh (WB) and Mr M. Sridhar Gore (Karnataka); associate vice-presidents — Mr Umesh Kumar (Assam), Mr Charanjit Singh (Punjab), Mr K. Krishna (AP) and Mr Partap S. Yadav (Maharashtra); additional general secretary — Mr Balwinder Singh (Punjab); joint secretaries — Mr P.K. Gupta (UP), Mr D. Lawrence and Mr A. Sharat Chandra Singh (Manipur). All-India Football Federation (AIFF) secretary Alberto Colaco told UNI today that the last match of first leg of the NFL would be played on January 23 between Dempo and Churchill Brothers. The coaching camp to select the Indian team will commence from January 24, at Nehru Stadium, Fatorda and selected probables have been asked to join the camp. First sports and athletic meet organised by Border Zone concluded here today. Hockey team of Border Range, Amritsar, beat Ferozepore Range 5-0. S.K. Sharma, IGP (Border Range) Amritsar, presented awards to the winners. The winners are: Satnam Singh (200m), Lakhwinder Singh (400m), Bhupinder Singh (110m), Amandeep Singh (800m), Jagdev Singh (10,000m), Gurdeep Singh (long jump), Pargat Singh (hammer throw, Gurdev Singh (shot put), Gurdeep Singh (triple jump) Greeco-Roman wrestling: Om Parkash (66 kg), Lakhwinder Singh (74kg), Gurmeet Singh (84kg); Rakesh Kumar (free style 60kg); judo: Naresh Kumar (66 kg), Amrik Singh (73kg), Hardeep Singh (90kg) and Gurbhajan Singh (100 kg). Namdhari beat Corps of Signals 4-3 via tie-breaker while Punjab Police overcame a fighting CRPF 1-0 in their respective quarterfinal matches. Both Namdharis and Signals wasted three penalty corners each as the match remained goal-less during the regulation time. The Ludhiana side emerged winners as they converted four out of eight penalty strokes as against three conversion by their rivals.